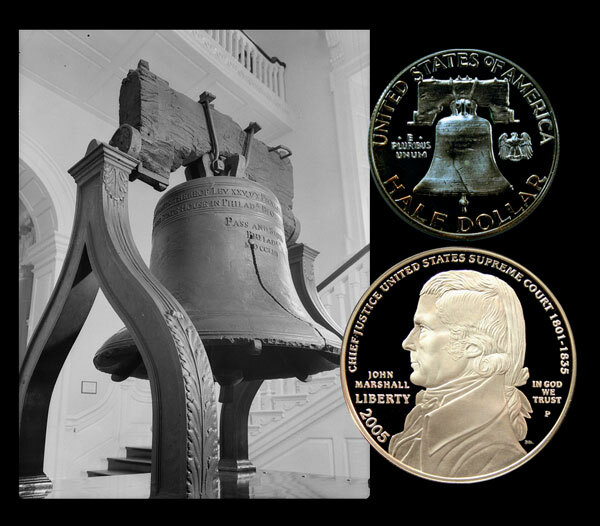 Today, the Franklin Half Dollar and the John Marshall Commemorative Silver Dollar Coins remember 180 years ago when the Liberty Bell cracked while honoring Chief Justice John Marshall. Next to the Declaration of Independence, the Liberty Bell is perhaps the nation’s most sacred memorial of the stirring times and events which ultimately brought independence and national government to the American colonies. Although the old bell is the property of the city of Philadelphia, which acquired the title to it by purchase (seventy thousand dollars) from the state of Pennsylvania, every citizen of the Union must feel a personal interest in the Liberty Bell. The bell was brought to America in 1752. Shortly after, having been cracked by a stroke of the clapper, it was recast by one of the city firms. Its tone, however, not proving satisfactory, it was a second time recast, after which it was raised and fixed in the steeple of the State House, which, later, became Independence Hall. The bell was primarily intended to summon members of the Assembly together, morning and afternoon, during the sessions of that body. It was, however, destined to fill an important place among the bells then in use, and the passage adapted from the bible: “Proclaim liberty throughout all the land unto all the inhabitants thereof” (Lev. xxv, 10), has since been looked upon as a prophetic inspiration. The bell rang on many occasions — the first time being on August 27, 1753, when the Pennsylvania Assembly, which gathered at its call, agreed that it would, in spite of the prohibition of the mother country, make and enforce any laws necessary for raising money for public use. On October 5, 1765, the bell was muffled and tolled when the royal ship from England, bearing the stamps for Pennsylvania, New Jersey, and Maryland, came up the Delaware. In answer to its sad tones several thousand citizens met that day in the Slate House square and decided to refuse permission to land the stamps. When the port of Boston was closed June 1, 1774, the muffled bell again tolled, calling together a town meeting, in which the citizens pledged themselves to espouse the common cause of liberty. On the day following the Battle of Lexington, the bell again called a public meeting for the purpose of discussing measures for the defense of life, liberty, and property. The bell summoned the Second Continental Congress to its first session, May 10, 1775, during which Richard Henry Lee offered his resolution for the independence of the colonies. Again it summoned, on July 4, 1776, the illustrious body that adopted the famous Declaration of Independence. Eventually, at noon of July 8, 1776, after the public reading of the liberty-proclaiming document in the rear of the State House on the square, it was joined by other bells of the city, in ringing out joyously in honor of the occasion. At noon of October 24, 1781, the bell announced the surrender of Cornwallis to the confederate arms of the United States and France; next, on April 16, 1783, it rang out the glad Proclamation of Peace. The thirteen states had now made good the Declaration of Independence, and from that day until now, the State House Bell was known only as the Liberty Bell. Its mission to “Proclaim Liberty” was now fulfilled to the very letter. For several years the Liberty Bell rang every Fourth of July and, from the Proclamation of Peace until it was silenced (1835), it proclaimed national anniversaries, ushered in the new year, welcomed distinguished men, and tolled for the noble dead. On the fiftieth anniversary of the Declaration of Independence (July 4, 1826), the bell was rung in commemoration of this event, and also, on that same day, it announced the death of both, John Adams and Thomas Jefferson. The bell last tolled on July 8, 1835. On this day the body of John Marshall, Chief Justice of the United States Supreme Court, was being borne to Virginia for burial. The bell, while tolling during the funeral services, suddenly, without receiving any violence, cracked. John Marshall was one of the greatest men of the Revolutionary times and the last of those who were associated with Washington and the signers of the Declaration of Independence. His death on July 6, 1835, in Philadelphia, brought, as it were, to a close the Revolutionary period of the history of the United States. Since the mission of the bell was to “proclaim Liberty throughout all the land unto all the inhabitants thereof,” the crack which developed while tolling on that memorable day may be looked upon as a fitting climax to the early history of our country. 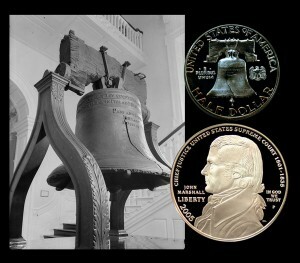 The Franklin Half Dollar reverse and the Chief Justice John Marshall Commemorative Silver Dollar obverse show against a view of the Liberty Bell.